LINDEN, Virginia (CelebrityAccess MediaWire) — Famed Portuguese vocalist and composer Jose Cid is starting to gain recognition in the United States on the strength of a new video, "2 Many Nights," which is starting to make traction on social media. Cid, who performs in both Portuguese and English, is an iconic figure in Portugal, regularly playing to standing-room-only crowds. His 2012 international tour saw him performing in 30 cities to audiences with 40,000 fans in attendance. While less known in the U.S., Cid has an impressive recorded music resume, notching up 25 Silver, 8 Gold (2 double) and 3 Platinum records over the course of his career, as well as an Emmy for his 2010 release "1 + day." Cid is a versatile multi-instrumental artist, whose work has covered a range of styles, from folk ballads to pop and jazz. He is widely regarded as a father of the pop/rock scene in Portugal and in 1967 co-founded the group Quarteto 1111, which went on to become perhaps the most influential progressive rock bands in the Iberian nation. Fronted by Cid on the piano, Quarteto 1111 put themselves on the map with their eponymously-named first full-length release in 1970. The album addressed issues of racism and the changing demographic of Portugal at the time, and soon ended up banned by the repressive Salazar regime. 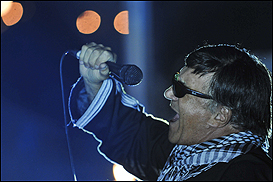 In fact, Cid clashed with Salazar several times over the course of his career and Cid, through his music, has become a vocal proponent for human rights. In 1995, he dedicated his CD For Humans Rights to East Timor’s Nobel laureate Ramos Horta. He also co-founded the 4 piece vocal pop group Green Windows, and has an extensive solo catalog with with more than 60 releases to his credit, including his 1980 hit “Um grande, grande amor”, which placed seventh when Cid represented Portugal in the Eurovision Song Contest.